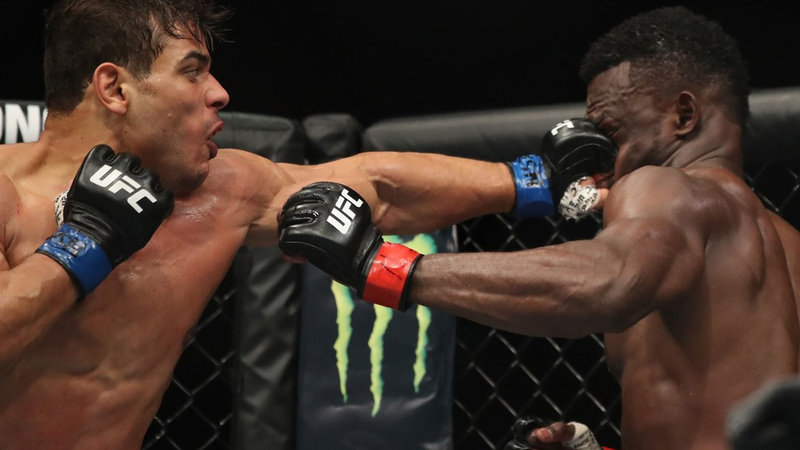 UFC 226 Prelims: Paulo Costa Earns An Impressive TKO Victory Over Uriah Hall! UFC 226: Paulo Costa Defeated Uriah Hall! In the last fight of UFC 226 prelims, Paulo Costa will face Uriah Hall. Paulo Costa (11-0 MMA, 3-0 UFC) is an undefeated BJJ specialist but he has 10 wins via knockout! His opponent will have a very hard time since this Brazilian superstar simply doesn’t have weak spots. And if the fight goes to the ground, you can bet on The Eraser, he earned that nickname for a good reason! Uriah Hall (13-8 MMA, 6-6 UFC) comes after a victory Krzysztof Jotko and a Performance Of The Night award. This decorated striker and master of Kyokushin Karate has few very attractive knockouts in his career. If the fight remains standing, at least it will be very interesting to watch. Just remember his legendary KO over Gegard Mousasi at UFC Fight Night 75! Round 1: Paulo Costa opens the opponent up with an early body kick. And another one, while Uriah returns with a strong jab! Body kick Costa, and a low kick response from Uriah Hall. One minute in, fighters are cautious, low kicks are landing. Good body kick by Costa but Hall creates a distance using his stance and movement and counters him again. Hall takes a foot to the nerds against the fence. Costa eats a spinning back kick to the body, tries to return with a wheel kick but Hall slips and delivers a jab. Hall is hitting every strike now! Right hand and a jab from Hall. Costa is on the fence but survives. Reversal and great shots from Paulo Costa, he is more active in this round, will the judges score this? Good body shot and right hand from Costa! An unintentional blow to the groin and Hall is stunned the referee stops the match and warns Costa. Body kick by Costa but Hall returns with a spinning back kick. The end of the round, probably 10-9 Costa. Round 2: Early jabs being traded but Costa attacks with maximum power. Good right hand from Costa and Hall returns with a jab to the body. Hall hits a double-leg takedown attempt to counter Costa’s attack… what a mistake, Costa is great on the ground! But he is unable to take the Brazilian competitor down. Costa eats a shot to deliver one. After a successful jab Paulo Costa delivers few right hands and Hall looks to be in trouble. But Hall returns with a tremendous strike which could rock the Brazilian rising star and… nothing, he survives! Paulo Costa again attacks with a body kick… this will be critical… fighters trading body shots. Costa attacks the head and body of the opponent on the fence! Hall goes back and eats a strong left hook, and another body shot which rocks him! The referee steps in and a TKO victory for Costa! Paulo Costa improves his UFC score to 4-0, while Hall’s score is 6-7 now.